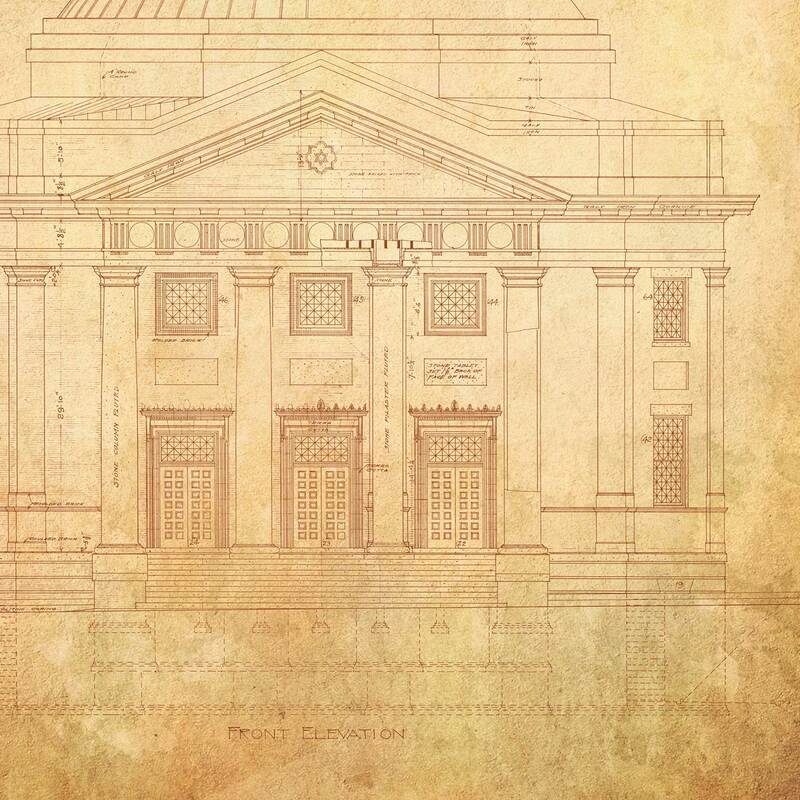 The word synagogue derives from the Greek word “synagein,” which means “to bring together.” It is an apt name for a structure that serves religious as well as social functions. Today Beth Ahabah is defined by a strong congregation of Jewish members, worshiping in the Reform tradition and maintaining their religious beliefs yet wholly participating in the lives of their city, state and nation. 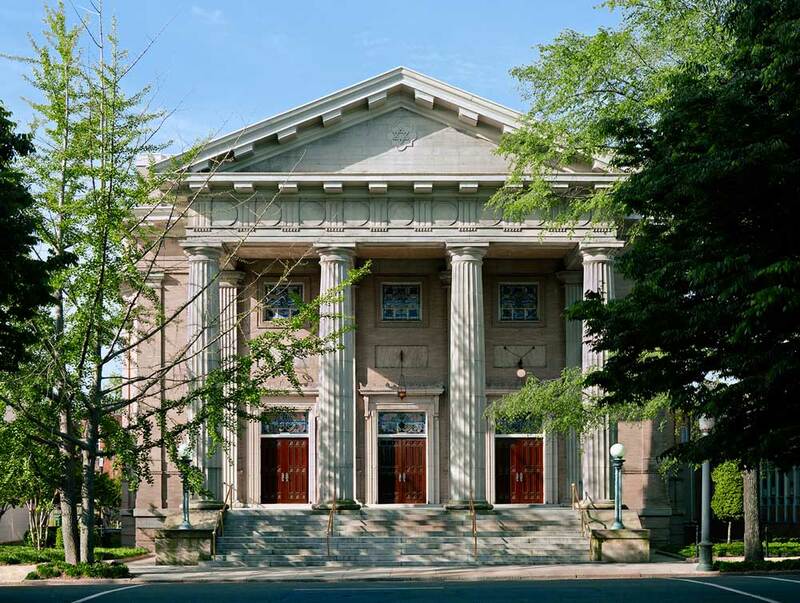 The Neo-Classical-style sanctuary is most noted for its proscenium arch. 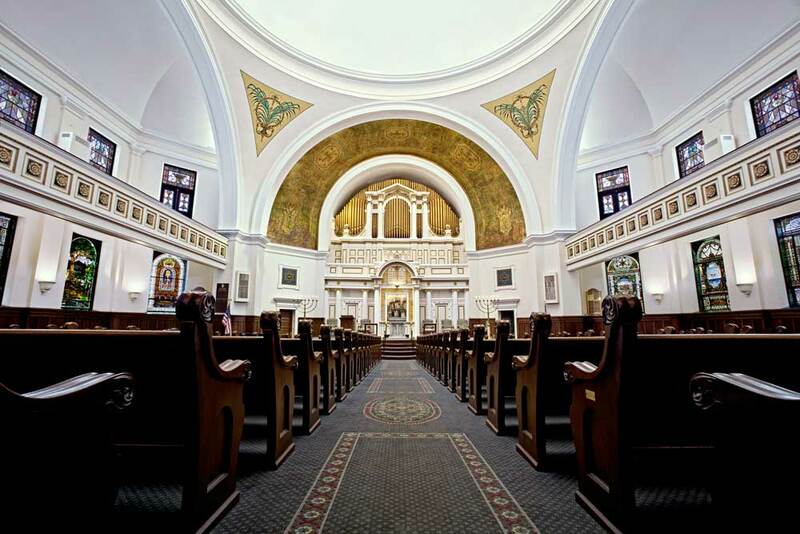 The arch still sports the elaborate painting given to it in 1913 after the Ladies’ Auxiliary had raised sufficient funds to give the previously austere sanctuary “the inspired touch of the artist.” The Ner Tamid or Eternal Light symbolizes God’s presence and hangs in front of the Ten Commandments at the head of the sanctuary. Original to the 1904 building, its use of the then new electric light bulb was an innovation in its day. The prominent placement of the pulpit and ark at the same end of the sanctuary, coupled with the magnificent original pipe organ, is typical of the “Americanized Judaism” preferred by Reform congregations of the day. The impressive pipe organ consists of over 2,000 pipes, ranging in size from 6 inches to 16 feet. 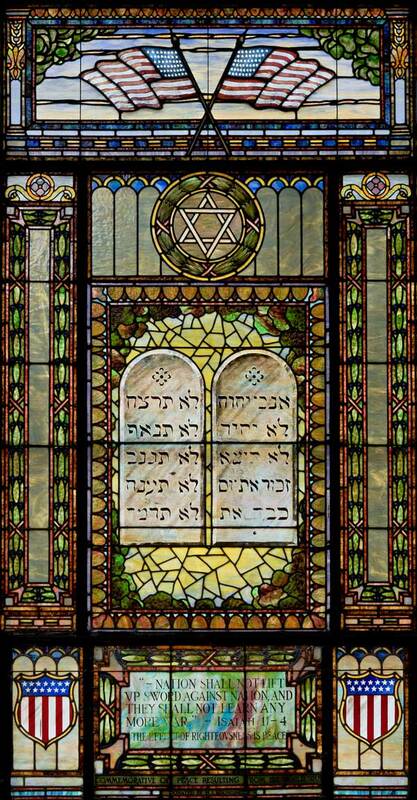 We are particularly proud of the 29 beautiful stained glass windows that adorn our synagogue’s main sanctuary. 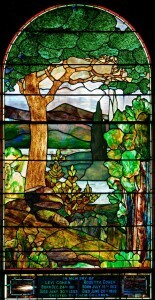 Many commemorate important congregants and include such images as the Eternal Light, the Burning Bush, the Garden of Eden, and the House of the Lord. 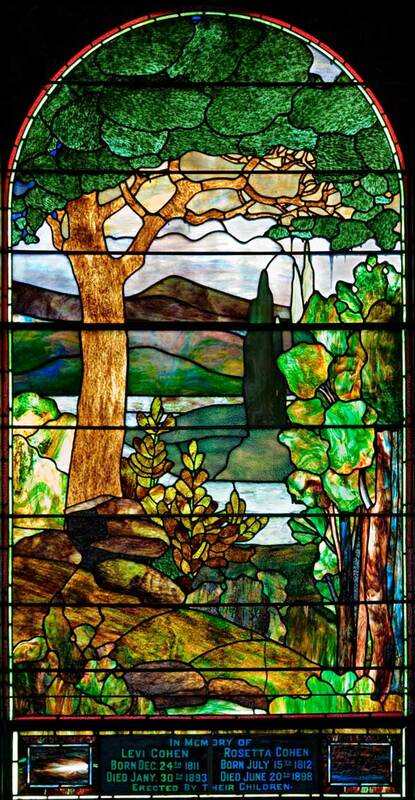 Most notable is a window by Louis Comfort Tiffany on the building’s east wall. 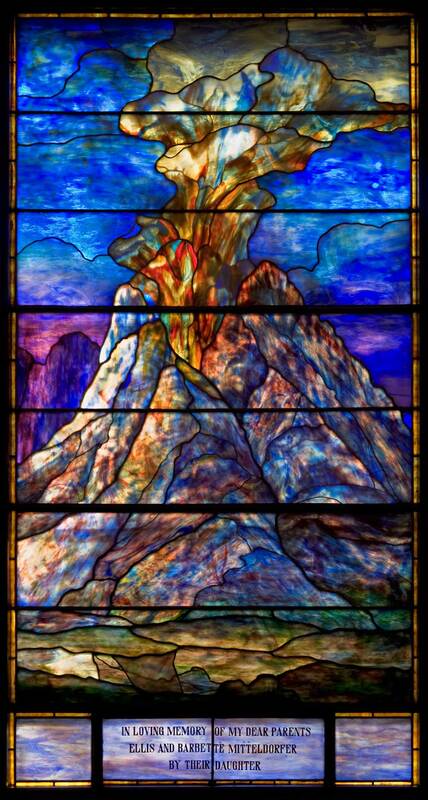 This striking window, depicting Mount Sinai at the moment the Ten Commandments were granted to Moses, was commissioned in 1923 by Fannie Mitteldorfer Schwab in memory of her parents, Ellis and Babette Mitteldorfer. Ellis Mitteldorfer was the son of Moses Mitteldorfer, one of the first presidents of Beth Ahabah. Tiffany’s signature is located in the lower right hand corner. The sanctuary’s nine other major windows are presented as they appear moving clockwise from the northeast corner of the sanctuary’s lower level. Dedicated to the memory of Rev. 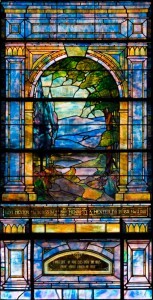 A.S. Bettelheim, this window depicts the words of Genesis 1:2, “And The Spirit Of God Moved Over The Face Of The Waters.” Dr. Bettelheim was Rabbi of Beth Ahabah from 1869 to 1875. He died while on an ocean voyage and was buried at sea in 1890. Dedicated to the memory of Levi (1833-1909) and Henrietta (1831-1887) Hexter and erected by their children. “I Will Lift Mine Eyes Unto The Hills From Whence Cometh My Help” Psalms 121:1. Levi Hexter was President of Congregation Beth Israel at the time of its incorporation into Congregation Beth Ahabah. 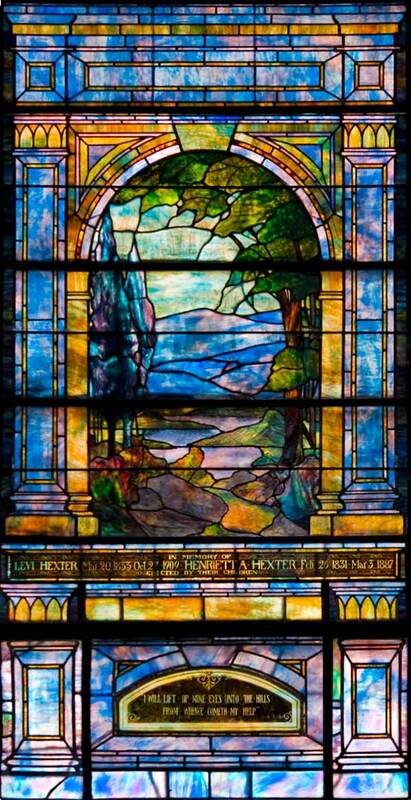 Dedicated to the memory of Levi (1811-1893) and Rosetta (1812-1898) Cohen by their children, the window features the lush vegetation of the Garden of Eden. 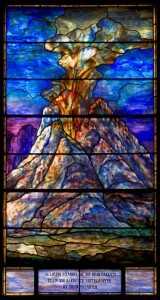 The first window installed in the current sanctuary is dedicated to the first spiritual leader of Beth Ahabah, the Rev. Maximilian J. Michelbacher. 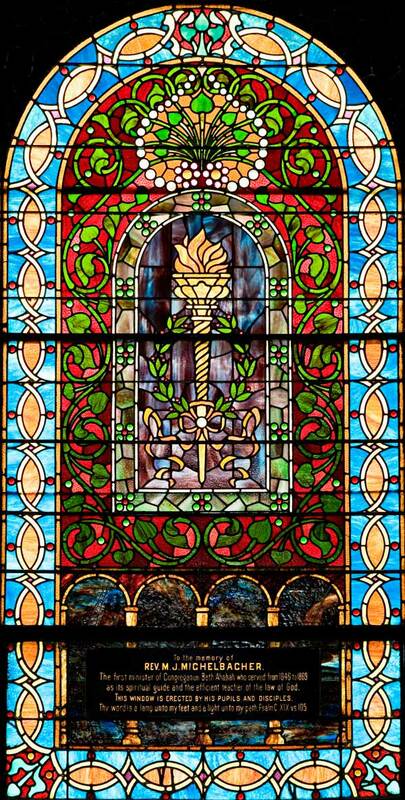 The window depicts the Ner Tamid, or Eternal Light, symbolizing the illumination of spirit and education that emanated from Rev. Michelbacher and filled the hearts and minds of all who knew him. “Thy word is a lamp unto my feet and a lamp unto my path,” Psalm 119:105. 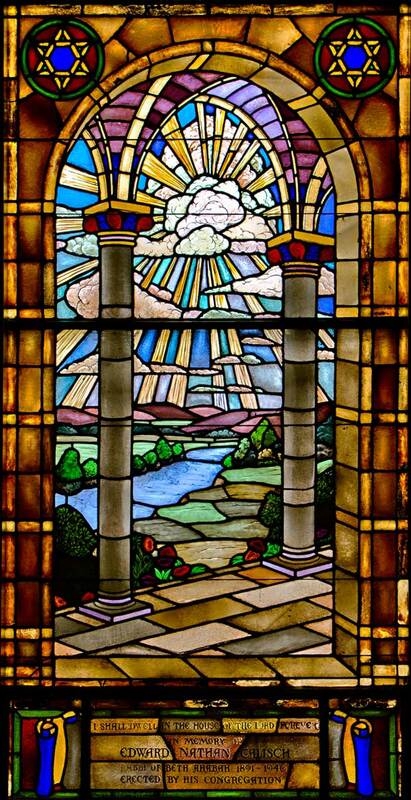 This window, in memory of Dr. Abraham Harris, depicts the biblical scene in which God appears to Moses in the Burning Bush. 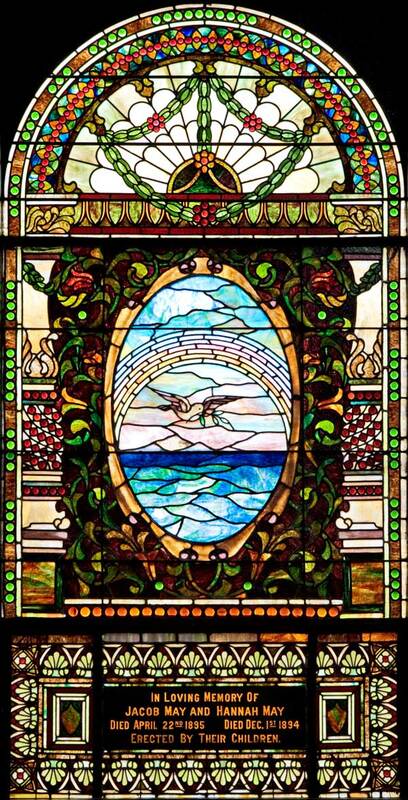 The white dove returning to Noah’s ark with the olive branch in its mouth is the centerpiece of this peaceful window given by the children of Jacob and Hannah May. 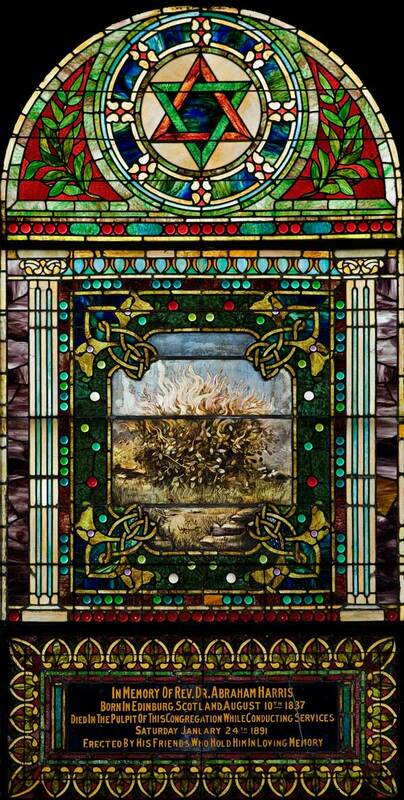 Consecrated as an act of Thanksgiving for peace following World War 1, this striking window donated by H.S. Binswanger combines American values represented by the flags and shields, and Jewish values as shown in the Ten Commandments and prominent Star of David. 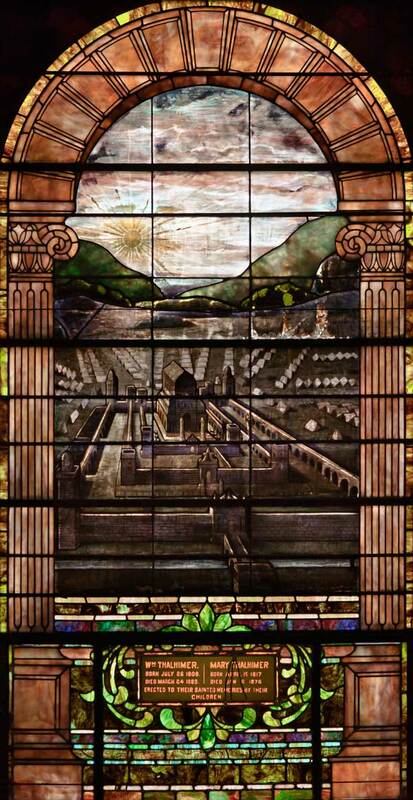 This window, the last installed in the main sanctuary, is dedicated to the memory of Dr. Edward N. Calisch, Beth Ahabah’s rabbi from 1891 to 1946. Designed by his son Harold, it depicts the Outer portion of the Temple in Jerusalem as seen from within. The verse “I shall dwell in the House of the Lord Forever” is from the 23rd Psalm, a favorite of Dr. Calisch. The window, erected by the congregation, is composed of glass especially made to catch the light streaming from the west. William and Mary Thalhimer’s descendants have served Beth Ahabah as officers and Trustees. This window depicts King Solomon’s Temple and its walled courtyard. Solomon’s Temple represents our search for the presence of God in our lives and for divine guidance. Our wonderful chapel is the result of a generous gift made by Nathan and Sophie Gumenick in 1980. The chapel was but one of the many ways in which the couple contributed to Congregation Beth Ahabah. (Their philanthropy extended elsewhere as well — most notably to Temple Israel in Miami and to Mt. Sinai Hospital.) 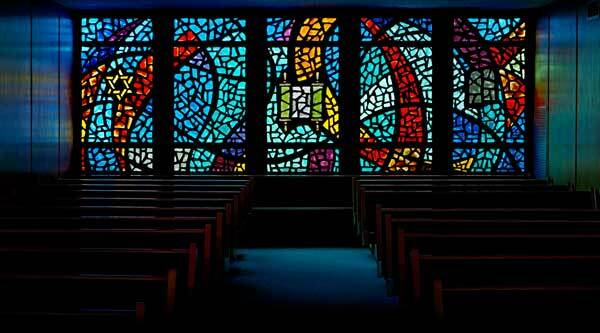 The 20-by-50-foot chapel seats approximately 100 congregants and features a beautiful rear wall composed almost entirely of colored glass. The chapel’s interesting metal Ner Tamid is the gift of Joseph S. Galeski Jr. and was designed by Ludwig Wolpert (1900-1981), a well-known sculptor, silversmith and designer of Judaica. The chapel is an excellent addition to our Temple campus, providing both an ideal space for smaller services and overflow seating for the main sanctuary.